You may recall that we broke the news here first last May that Richemont Group was creating an all-new brand: Baume. 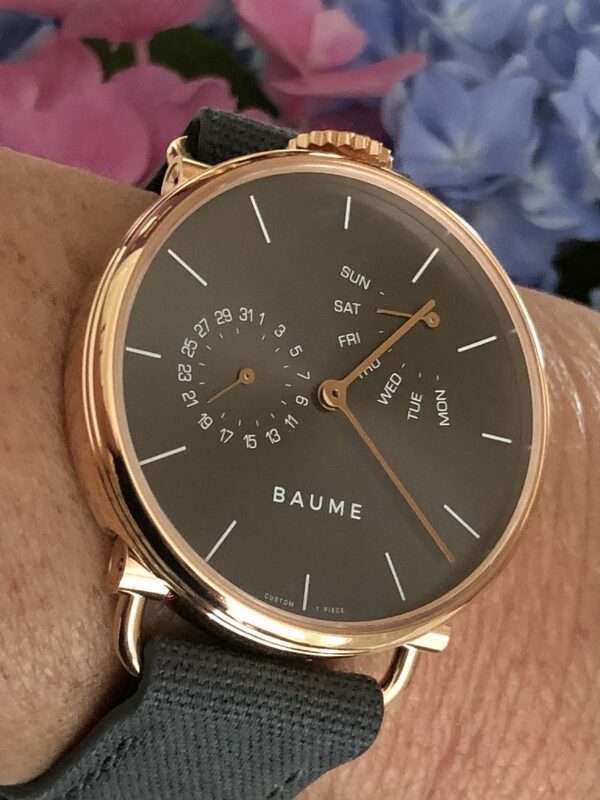 Not to be confused with Baume & Mercier, but a brainchild that was formed under that brand’s wings, the new Baume brand can be purchased only on line, and buyers can customize their own custom watch if they so desire, or buy an already designed watch. Baume gave me the opportunity to customize a watch of my own, which I did, and I have now been wearing for several weeks. 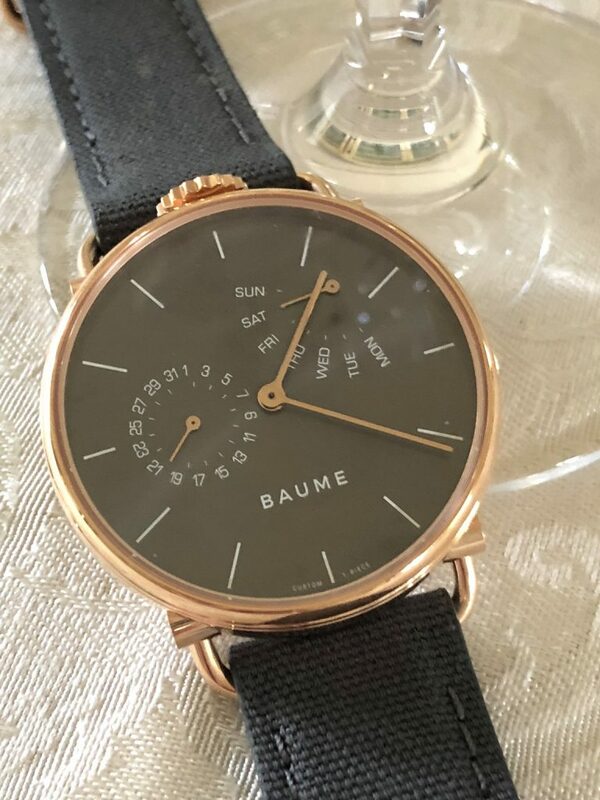 Here, I go into depth on the building of my own Baume watch, and review the watch, as well. The customization of my own watch was super easy. I visited the Baume website and scrolled through the different models that were available. All of the watch modes are considered genderless, and range from 35mm to 41mm in size. As mentioned, some are already designed and you can pick one of those. 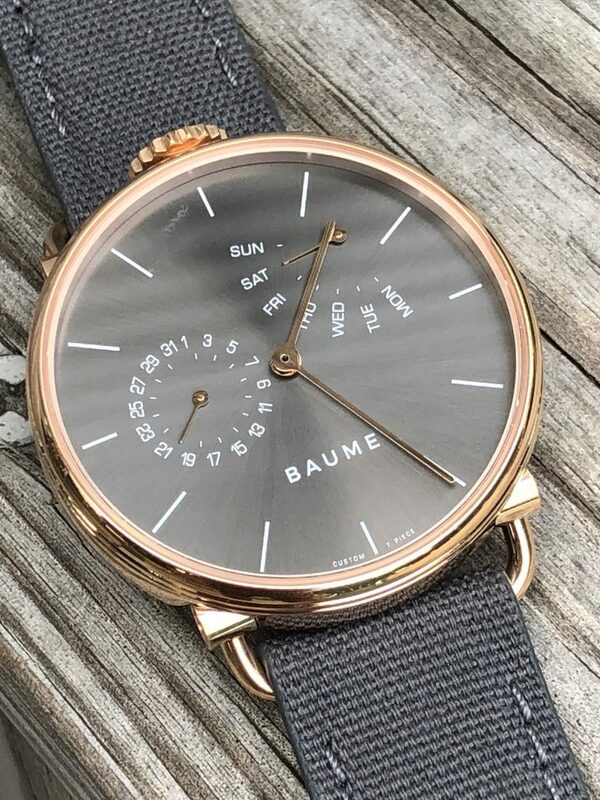 Baume does not actually build any watches (already designed or customized) until the order is placed, in order to reduce the need for inventory stocking and to reduce the threat of over production. 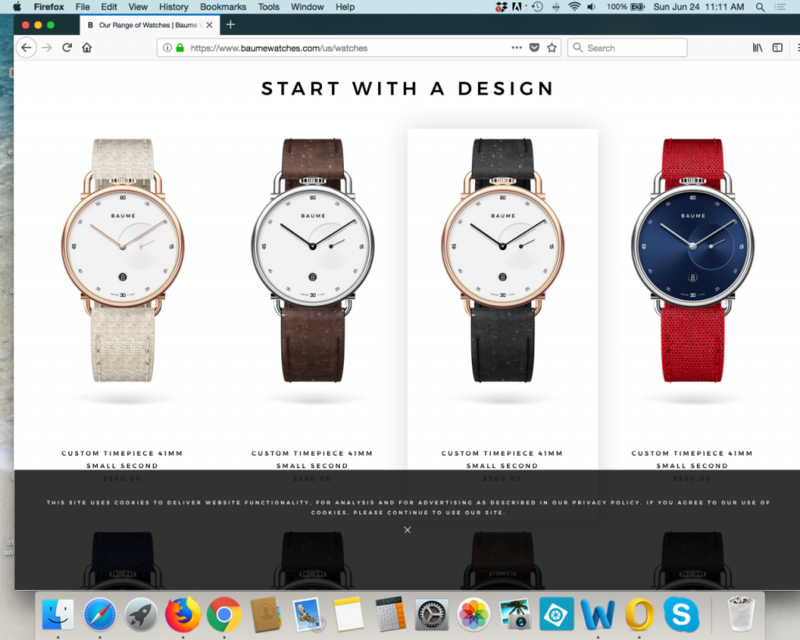 Screenshot of the process of starting to customize your own Baume watch. I elected to build my own watch, and scrolled through to find the watch I wanted: a 41mm day/date calendar watch with retrograde day of the week indication. The choices if you start from scratch include the retrograde I built or a small seconds option. (If you opt for an already responsibly made Baume watch, there is the choice of a 35mm a moon phase choice — and that one is a beauty.) With the model selected, I then got to select my dial color and the color of the numerals/markers, as well as the case finish and the strap. All Baume watches are sustainable with case materials that include aluminum, steel and PVD steel. The straps are made from natural materials including cotton, cork and linen. Sadly, when I created my watch, there was no option for a white strap, so I selected gray. Just this past week I learned that the company has added white to the strap color choices. One other very nice feature about ordering my watch was that I was able to further personalize it with an engraving on the case back. The process was quick and easy, and I knew I was getting something I semi-designed. 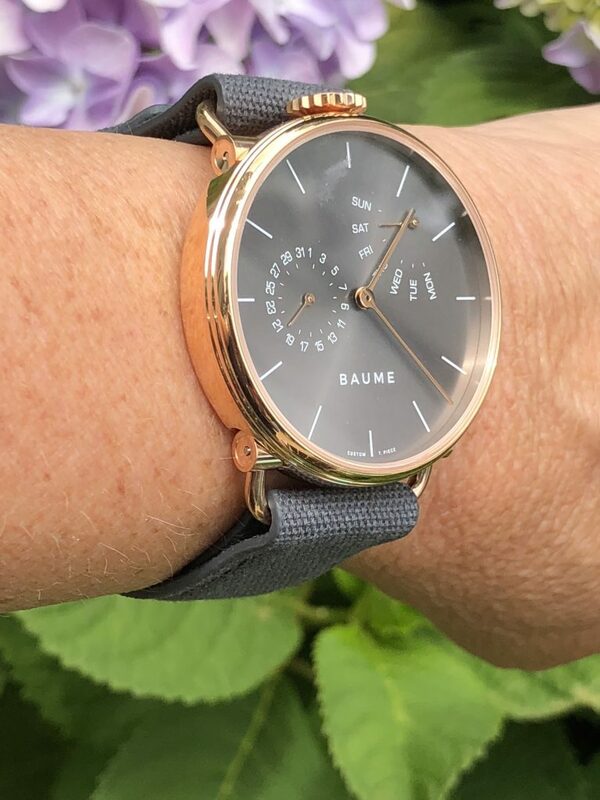 Baume watches are considered unisex and range in size from 35mm to 41mm. From the moment I ordered my watch, I received regular email updates from the brand. The first email welcomed me to Baume, while ensuing emails gave me the status update of my order, including emailing me when the watch shipped. This was process was comforting and let me know that the brand was on top of my order. When the watch arrived, it was in a no-frills package. This is consistent with the brand’s sustainability concept. There is no fancy box. A cardboard box made with FSC-certified cardboard arrived and within it was gray FSC-certified cardboard cylinder. Inside that cardboard cylinder was a simple biodegradable gray watch pouch that held my watch. 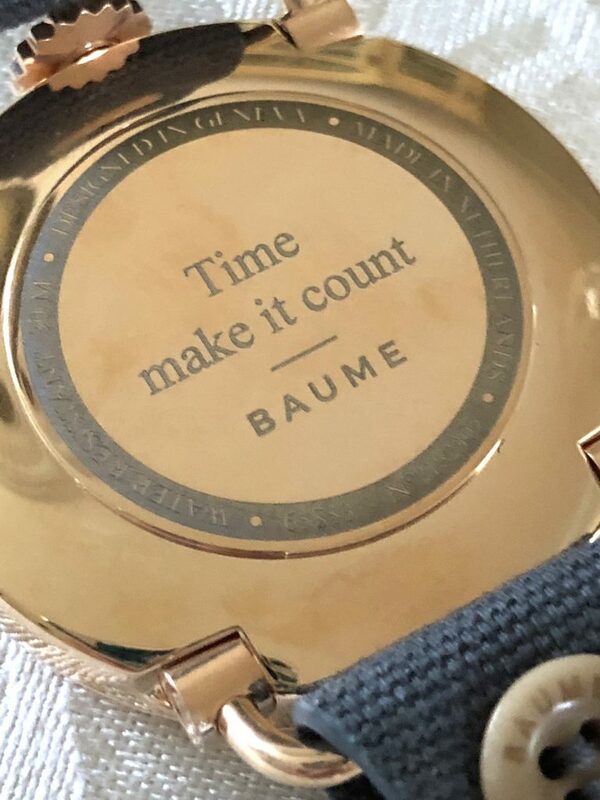 You can even personalize the back of your Baume watch. As mentioned, I selected the 41mm day/date watch in PVD rose gold color with date subdial and retrograde day indication. I opted for a slate gray colored dial with white markers and accent colors and rose gold colored hands. I naturally also opted for a rose gold colored buckle. The strap choice was gray to integrate seamlessly with the dial, although I did want white, it was not really available in true white when I was ordering (it has since been added to the selection). The nice thing is the straps are interchangeable, so I can now buy the white strap I like and change them off at will. I personalized it with a saying that means something special to me: “Time. Make it count.” Every day when I put that watch on my wrist, I looked at that saying first, and it was a great way to start my day. Because I had a hand in the design of my watch, I naturally like it. I love the functions and the case design, with loop lugs and the crown at 12:00. The colors make the watch easy to read and the look is seamless. Perhaps the only down side is that I am not in love with the fabric of the strap. It is a bit too flimsy for my liking. However, as mentioned, since the straps are interchangeable, I will most likely order a different material gray strap. Overall, I enjoyed personalizing the watch. I love the result and I am quite pleased with the quality and design. I must say that it feels good to have a watch that I had a hand in making. Having the ability to select what you like is a nice feature. It is a concept that works wonderfully as a self-purchase, as well as a gift for someone you love on a special occasion. The watches retail starting about $560, so gifting is an option. I also like the concept behind Baume. Creating a brand using up-cycled and recycled materials is appealing, as is the idea of not over producing. There is so much more to this brand than meets the eye. You can read the complete details on the new Baume brand here.